How A2X creates the default accounts for Amazon accounting and what type of accounts are they? A2X interprets your settlement data from Amazon and categorizes the transactions into the higher level transaction types on the left-most column, such as Adjustments or Amazon Delivery and Transport. When you first go to set up your Accounts and Taxes mapping, you will see that A2X can create a number of generic default accounts for you to map transactions to. For example, you'll see "Create account Amazon FBA Fees" in the first row. 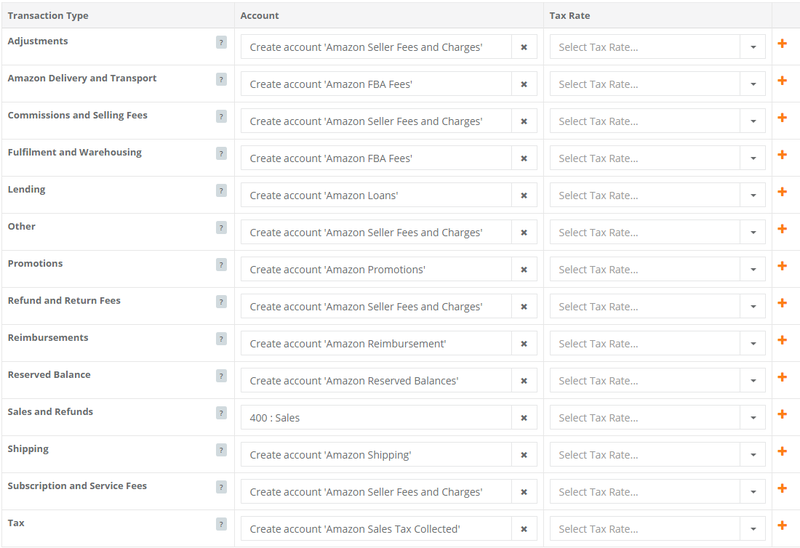 When you select this option, A2X will automatically connect to your accounting system and create an expense account called 'Amazon FBA Fees'. Then, it will map all appropriate fees from settlements into that expense account in your general ledger. Because A2X is connected to your accounting software, it is importing your complete chart of accounts. If A2X detects an account that already matches the default, then it will be pre-selected. As an example, in the situation below, there is already an account called "Sales", so A2X will not offer to create another one. Instead of our generic default accounts, you can select your own account for any transaction type. Just click on the "x" to open the dropdown, use the scrollbar to find and select the account from your Chart of Accounts list. A2X uses account codes that indicate the accounts were created by A2X such as: "a2xship" and "a2xres". This will differentiate them from the default codes which are often numeric sequences such as 400, 401 etc. The generic accounts created by A2X will assign your transactions into the account types, that will generate a reasonable set of financial reports without needing to spend a lot of time on the account mapping process. In general, as your business grows and you have input from your financial adviser, you will likely want to customize the settings to suit your financial reporting requirements. The names of the account types created in Xero and in QuickBooks are slightly different but, in accounting terms, they are the same. Expenses and Sales or Revenue or Income accounts will be on your Income Statements. Current assets and current liabilities will be on your Balance Sheets. To start experiencing the simplicity of doing your Amazon accounting in A2X, click on Save mappings at the bottom. This creates the accounts in Xero or QuickBooks Online and also maps these new accounts to your settlement transactions. With this setup task complete, you are ready to send your first settlement!